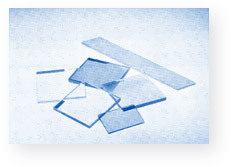 All listed color glass filters can be individually fabricated to your requirements. Additional coatings, cemented filter combinations, assembling of different color glass, filters and glass materials and thermal tempering are possible and part of our daily production. Additional optical, thermal and mechanical material specifications are available on request .